Post-apocalyptic games are games set in a post-nuclear-war or otherwise disaster-stricken world. DNT is a free game. This means that the source code is available to be studied, modified, and distributed. Most projects look for help with testing, documentation, graphics, etc., as well. 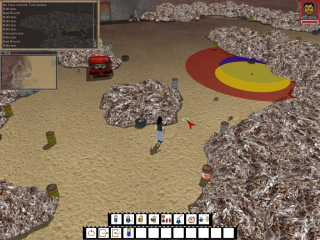 DNT (formaly known as DccNiTghtmare) is a free 3D single player RPG in a satirical post-apocalyptical world. 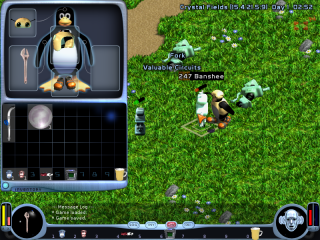 The game development started in early 2005 and is still active today. The game's source code is licensed under the GPL as its own media. Some other media are either under CC-BY, Public Domain or GPL licenses. Fighting a larger bot with the help of one hacked earlier. Freedroid RPG is a free game. This means that the source code is available to be studied, modified, and distributed. Most projects look for help with testing, documentation, graphics, etc., as well. Freedroid RPG is an isometric RPG, it's code and content are licensed under the GPL. The game uses OpenGL hardware acceleration by default but can also use SDL graphics. PARPG is a free game. This means that the source code is available to be studied, modified, and distributed. Most projects look for help with testing, documentation, graphics, etc., as well. PARPG is a post-apocalyptic roleplaying game currently in the planning stage for a second techdemo release. Its source code is licensed under the GPLv3 and its assets under CC-BY-SA 3.0. Warzone 2100 is a free game. This means that the source code is available to be studied, modified, and distributed. Most projects look for help with testing, documentation, graphics, etc., as well. 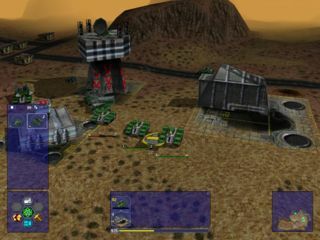 Warzone 2100 is a real-time strategy game originally written in C as a closed source project by Pumpkin Studios. It was released (excluding the videos) under the GNU General Public License in late 2004 by Eidos Interactive. Now development is in the hands of the Warzone 2100 Resurrection Project. This page was last edited on 28 May 2018, at 09:16.